No matter how you slice it, when you add the word "free" to anything, it's priceless. Literally. The FREE FRESCHETTA® By The Slice pizza event is coming to a virtual world near you. No need to leave the house, put on make-up, or break a sweat. This one is easy, folks. FRESCHETTA® will be giving away thousands of slices of their delicious By The Slice pizza in a special live online event. 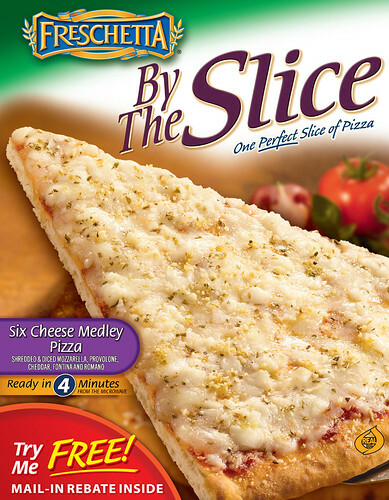 The FRESCHETTA® By The Slice pizza will be given away in 5,000 increments every half hour. On Thursday, July 28th, 2011, visit the website www.FreeFreschetta.com to sign up for a reminder email. On August 4th, a reminder email will be sent to those that signed up, Then, the event will be live at 11 AM on this day for all to sign up! On the day of the event there will also be fun, interactive contests where additional coupons will be awarded. Simple, right?! I've had the pleasure to try-out this wonderful pizza. Not only is it delicious, but it's also a breeze to prepare. Tell your friends. Your neighbors. Your mom. Your dad. If you tell enough people, and they win, you could have yourself an entire pizza. Yum-my! Disclosure: I am a FRESCHETTA™ FRESH CONNECTION™ member. By posting this information, I am eligible for member-only prizes. There was no compensation for writing this post. The opinions and views are my own.